Jeffery Earnhardt #00 VRX Racing Simulators Chevy Camaro-I like the blue and silver color scheme, it works well with the white. I don’t like the side designs, I think they are overdone. All things considered, I give it a C.
Danica Patrick #7 GoDaddy/Warriors By Danica Chevy Camaro-The green design is smooth, but I don’t like the black rear. It takes away from the overall look. It’s a minor complaint, and the scheme earns an A-. Chase Elliott #9 Mountain Dew Chevy Camaro-It’s a great look, with a great color scheme, and it earns an A.
Erik Jones #20 Circle K Toyota Camry-Same basic scheme as last year, same A grade. Landon Cassill #34 Love’s Truck Stops Ford Fusion-Same scheme as last year, same A grade. Chris Buescher #37 Kleenex Chevy Camaro-Another silver, blue, and white color scheme that is over designed to the point of being ridiculous. It just doesn’t look good from a design perspective. The color scheme is good, so I’ll give it a C.
David Ragan #38 Speedco Ford Fusion-The shade of blue and the shade of yellow work very well, and the design works very well too. It’s worth an A.
Justin Marks #51 Keens Buildings Chevy Camaro-The scheme is too over designed, and while the color scheme is decent, it’s just a mess, and it gets a D+. 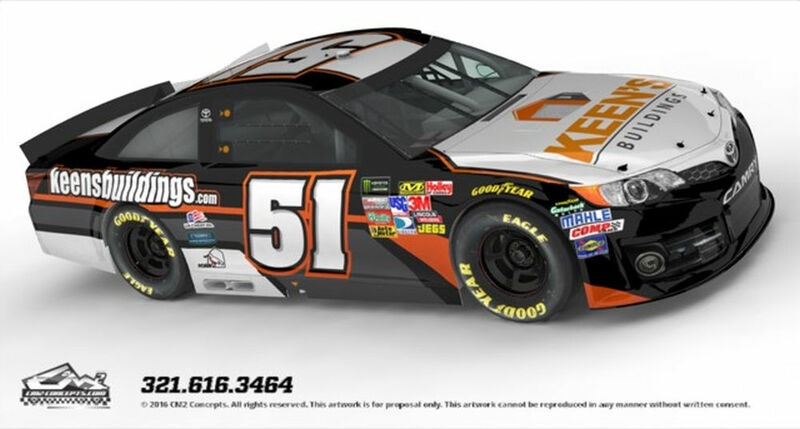 DJ Kennington #96 Lordco Toyota Camry-Same basic scheme as last year, same C- grade.